Motor City Electric Co. was excited to be selected as the electrical contractor for construction of a new contemporary design, eight-story bed tower at St. Joseph Mercy Oakland Hospital. 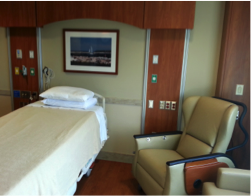 The South Patient Tower initially includes 204 private rooms, and is considered the most technologically integrated healing environment in the country. 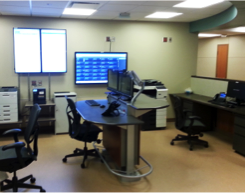 The 301,000 square foot building features the Intelligent Care System, the first of its kind, which provides important tools for clinical staff. These tools allow them to provide the finest in patient care, comfort, safety, and satisfaction. The state-of-the-art integrated technology includes continuous monitoring of patient vitals, support fall prevention, and direct voice communication between nursing staff and patients. All of this new technology is, of course, powered by electricity. 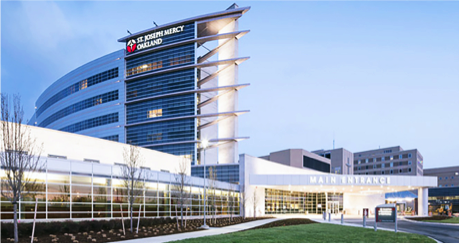 From building electrical rooms and installing switchgear to running conduit and splicing cable, Motor City Electric Co. helped St. Joseph Mercy to create an efficient, safe, and inviting environment. Families and friends were also factored into the design for the new tower that include amenities such as complimentary Wi-Fi, a “family zone” in each patient room, sofa beds with a flip-up table for eating or working on a computer, personal speakers so visitors can read or watch TV without disturbing patients, and more. The unique healing environment of the South Patient Tower includes an inviting lobby with a large fireplace, skylights, convenience and gift stores, and a pharmacy. The décor includes original artworks by Michigan artists including Monty Nagler, Carl Sams II, and Darcel Daneau.